Us, Today started as an organic experiment in sound. With the unique instrumentation of vibraphone, keyboard, guitar, and drums they set out to create music that defies genre. The group started with a chance meeting in 2010 at a coffee shop, and a discussion of a shared interest in St. Vincent. 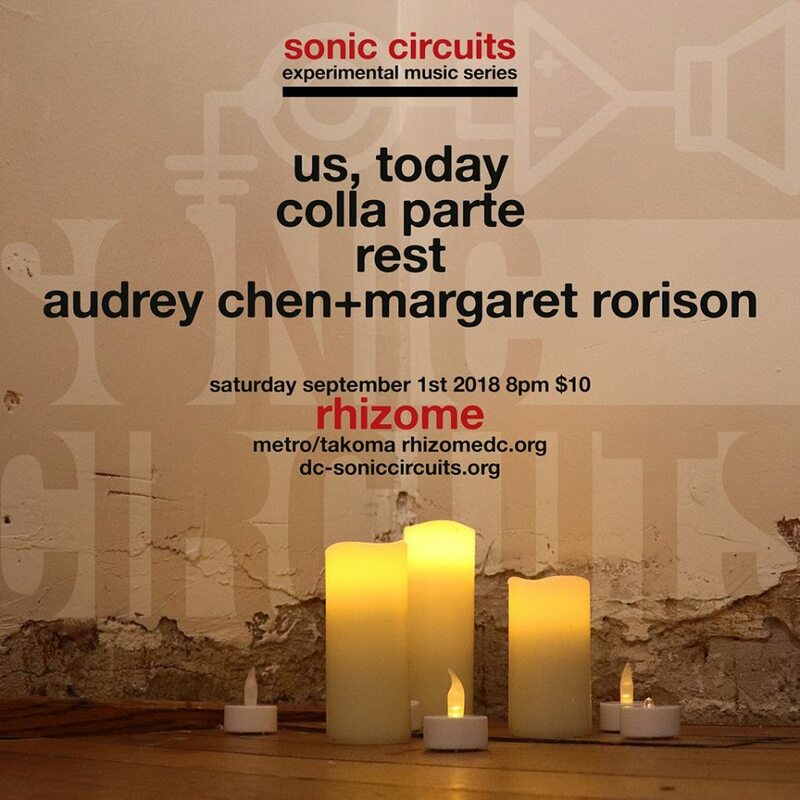 The three members, Kristin Agee, Joel Griggs, and Jeff Mellott, began weekly improvisation session, experimenting with their unique sonic possibilities. Improvisations turned into compositions. To date, Us, Today has released three albums. “RH Sessions” (2011), “Beneath the Floorboards” (2012) and “TENENEMIES” (2015). Each album shows a progression of the band, from a free improvisation background, to a more composed and polished sound. Since their 2015 release, Us, Today has had the pleasure of sharing a stage with Sylvan Esso, Kishi Bashi, Deerhoof, Ghost-Note, and the Mike Dillon Band. They have toured extensively through the midwest, and have played several festivals including Midpoint Music Festival (Cincinnati, OH) and Secret Stages (Birmingham, AL). Their anticipated 4th album “Computant” (2018) shows another step in their sonic progression, to a more unified, electronic sound. Drawing on traditions of jazz and contemporary art music, Colla Parte creates free chamber improvisation that moves from expressionistic intensity to reflective introversion and back again. The group is (in alphabetical order): Daniel Barbiero (double bass), Perry Conticchio (reeds), and Rich O’Meara (vibes and percussion). Daniel Barbiero Daniel Barbiero (1958, New Haven CT) is a double bassist, sound artist and composer in the Washington DC area. He has released work under his own name and with such artists as electronic composer/bassist Cristiano Bocci; percussionist/electronics artist Massimo Discepoli, If, Bwana (Al Margolis); Ictus Records percussionist Andrea Centazzo; Blue Note recording artist Greg Osby and electronic composer/sound artist Steve Hilmy. His compositions have been performed by The Subtle Body Transmission Orchestra, the Greek ensemble 6daEXIt, the Lower Mid-Atlantic Improvisers’ Orchestra, and others; he has performed works by composers Makoto Nomura, Alexis Porfiriadis, Wilhelm Matthies, Silvia Corda and others, some of which he commissioned. In addition to purely musical projects he regularly collaborates with dancers and has contributed soundtracks to experimental films and videos. He writes regularly on music and other arts for Avant Music News, Arteidolia, Perfect Sound Forever, Percorsi Musicali and other online publications. Rich O’Meara (b. 1957) is best known for his compositions for marimba that are performed throughout the world. His work has been featured on the NPR program “New Sounds”, the PBS documentary “The Music Instinct, Science and Song” and can be heard on the Audite, Cybele, Animato, Codamusic, and Koch Discover International record labels. He gave a master class and concert of his works at the Eighth International Festival of Percussion in Patagonia, Argentina and has received four ASCAP Plus awards. Since 1999 he has been a member of Silent Orchestra; a collaboration with composer/ keyboardist Carlos Garza to develop and perform new scores for classic silent films. Recent performances include the Smithsonian Museum, the National Gallery of Art, the National Museum of Women in the Arts, the Virginia Film Festival, the Savannah Film Festival and the Percussive Arts Society International Convention. Silent Orchestra scores for “Nosferatu” (1922) and “Salome” (1923) are available on DVD from Image Entertainment. MARGARET RORISON is a curator and filmmaker from Baltimore, Maryland. Her works often develop from explorations through rural and urban landscapes, combining language, sound and imagery to create installations, films and live 16mm projections. She is interested in the visceral nature of experience and the potentials of storytelling through the use of 16mm projection and sound, often sharing bills and collaborating with sound artists to explore new ways in which the image and machine can converse with sound and performance. Rorison is the recipient of a 2016 Rubys Artist Project Grants in media and performing arts, a recipient of The Maryland State Arts Council 2016 Individual Artist Awards and 2015 Sondheim Semi-finalist. She was awarded a 2015 Grit Fund Grant in addition to a 2012 and 2014 Launch Artists in Baltimore Grant to start a new experimental film series, Sight Unseen which has been running since 2012. AUDREY CHEN Abandoning the strict aesthetics of her otherwise “classical” training, Audrey Chen has developed a highly expressive, individual approach to voice and cello – with both instruments she uses various modes of experimentation that touch on the abstractly beautiful and the aggressively unsettling, at odds with her initial musical background. A variety of extended techniques are used, sometimes augmented with analogue electronics. Her powerfully dynamic approach to vocalizations is a key part of her tense and sometimes volatile performances, and in recent years focus has shifted further in this direction, with the voice becoming the primary component of her sonic capabilities. Chen is Chinese-American, originally from the United States (Baltimore via NYC, New Hampshire and Chicago…), and currently resides in Berlin. She has appeared at numerous festivals and maintains a busy touring schedule, bringing her to events around the globe. Though a significant force as a solo artist, Audrey’s performances and recordings have seen her form part of numerous duos with such figures as Phil Minton, Henrik Munkeby Nørstebø, Doron Sadja, Richard Scott, Maria Chavez and a collaborative project with German conceptual artist, John Bock.